This Saturday, Macy’s is having its umpteenth zillionth one-day sale of this year alone and I’m not mad. 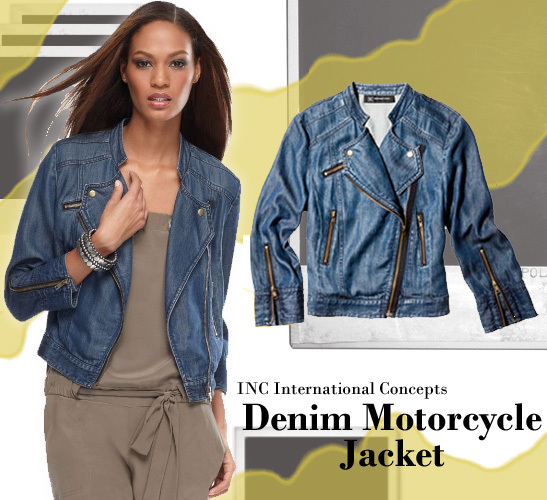 I definitely won’t be mad if this INC denim motorcycle jacket is part of the sale. More after the jump! I have been wanting this book for a long time, but just never got around to it. 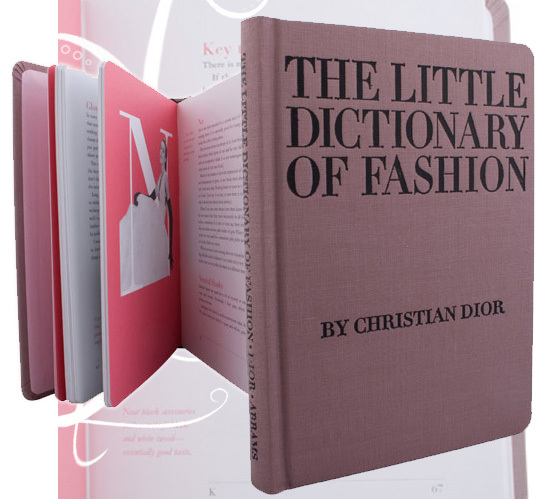 The Dictionary of Fashion was written by Christian Dior in the 50s. Obviously, the book will probably be no help to you if you are looking for a reference book to help your dressing sense today, but if you are like me and love to collect fashion related hard cover books, then this might be something you consider picking up. It looks so retro, too! I love Jessica Szohr! See’s definitely a nice calmness to the dram filled Gossip Girl. Unfortunately, I haven’t had the chance to get into GG this season. So, I will start playing catch-up in the next couple of weeks. Shh, don’t spoil it for me! However, in the meantime, check out Miss Szohr on the February cover of Teen Vogue. The issue hits stands on January 9th. For lunch today, we should all pull ourselves a chair to the nearest screen and gawk and fawn over W magazine’s fashion spread. The spread was shot by photographer Craig McDean and features over 70 looks by 50 designers. Yummy! This is going to fill me up more than my frozen dinner I brought for lunch! Here’s the link to get your gaze on! Happy lunching! Everywhere you look and listen, all you seem to hear is that Americans are spending less and less. However, there are some people that are still buying and I’m an one of them, because fortunately for me I haven’t had to experience any blow to my pocketbook that wasn’t already there before the credit crunch and wall street collapse. So, needless to say, there are still a substantial amount of people that still want to shop, but are aware of the economic situation that is going on and want to be more aware and prepared when shopping. This really applies now that we are on the cusp of the holiday shopping season. The latest book that I’ve had in my purse that I’m almost done reading is Shoptimism by Lee Eisenberg. I’ve had the pleasure to receive this book early to review and I’m glad that I’ve had the chance before I go on my annual holiday shopping mini sprees. In the book, Eisenberg does a very firm and direct way of breaking down today’s world of buying and selling by giving readers an inside look at retailers tactics while giving us readers ways to understand and sometimes climb over it. He accomplishes this through interviews with people behind the scenes in retail marketing and selling and with the people that keep those people on their toes- shoppers and consumers. He also ponders the question- “Why do we buy?” and various answers to the question. I really enjoy a good and informative book and this is definitely one of them, because I feel that I am little more equipped and informed as I start my holiday shopping marathon. If you want to be more informed in your future shopping trips, then you should definitely pick up this book. Shoptimism will be available on November 3, 2009.